Friends of Negus McClean gather near the spot where he was murdered on Sunday Night. McLean was stabbed to death by a gang of youths on Westminster Road in Edmonton, North London. McLean is the 4th teenager to be stabbed to death in London in 2011. 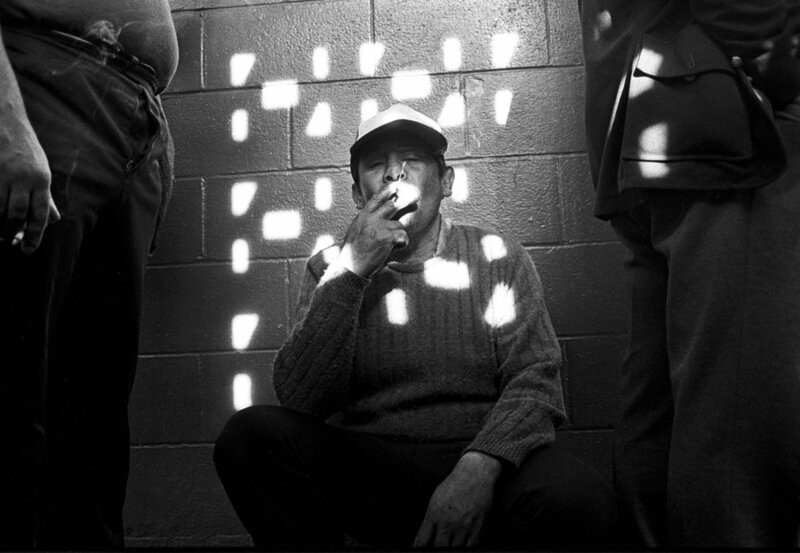 A homeless has a smoke while waiting in line at a homeless shelter hoping for a bed and meal for the night in Fresno, California. young man with an addiction to sniffing paint lives in an abandoned steel factory in Fresno, California. A young child boxer in an Los Angeles youth club. Two Mexican farm workers spar in a boxing ring they built from scratch in a farm field where they work in Corcoran, California. Young kids mill around waiting for a punk rock concert to start in Fresno, California. A young Nicaraguan man prepares for his day as the morning light comes through the windows of a safe house for Central American refugees in Tegucigalpa, Mexico. 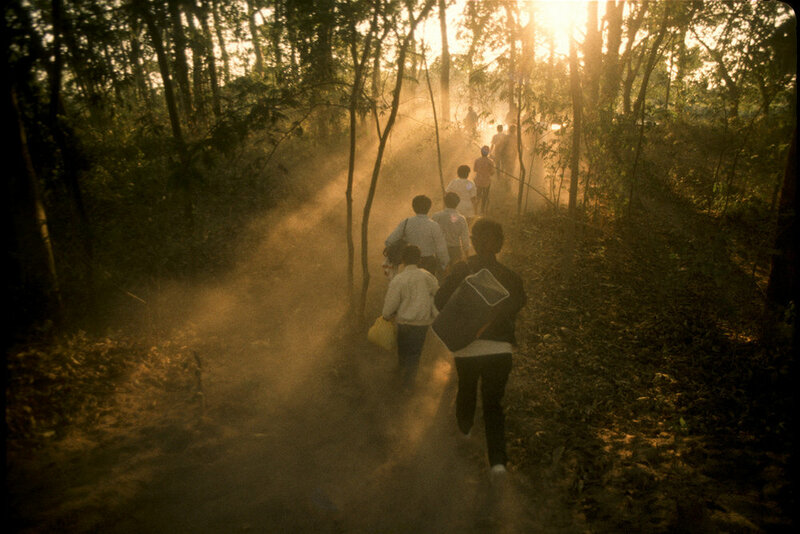 Nicraguan refugees cross the border between Mexico and Guatemala as they make their way to the United States. A family buries a relative killed during protests against the military coup against the democratically elected president Jean Bertrand Aristide. 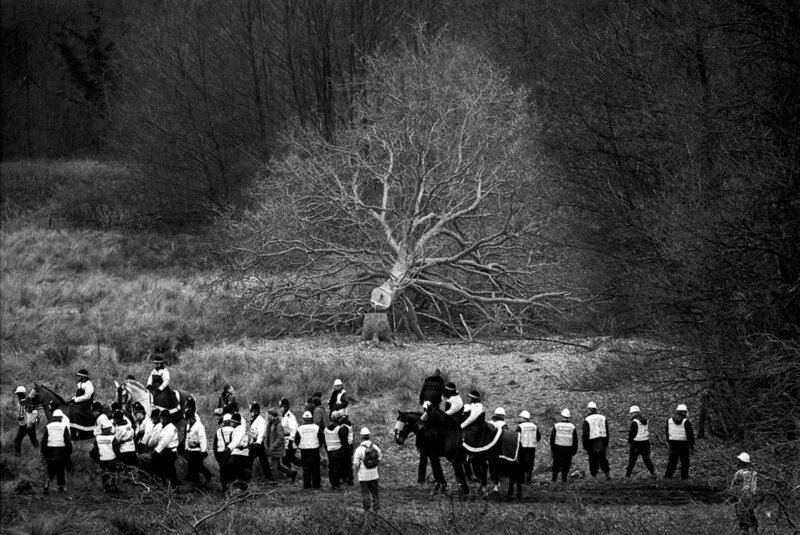 A Protester clings to the top of a tree preventing a contractor from cutting it down during protests against the Newbury Bypass Road. 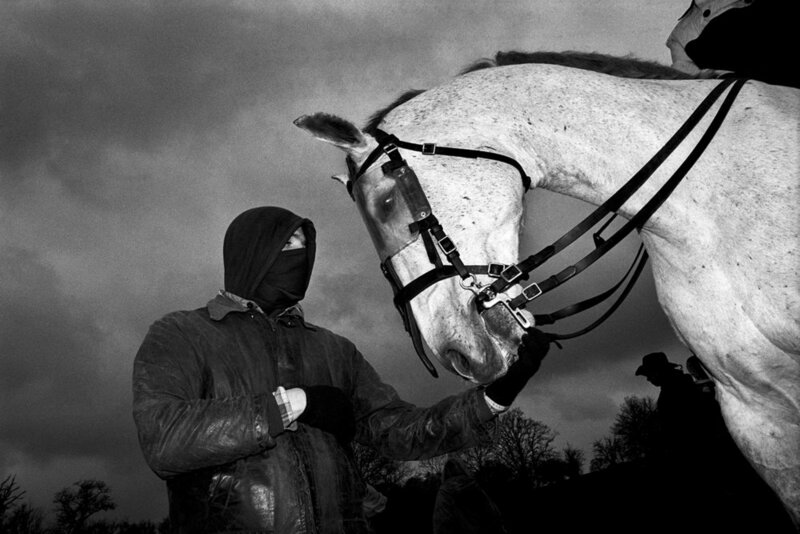 Between January 1996 and April 1996 the clearance of approximately 360 acres of land, including 120 acres of woodland, to make way for the building of the road, led to some of the largest anti-road protests in European history. Protestants watch a march by the Apprentice Boys of Derry during loyalist marches in Ballymena. A father helps his daughter with her bagpipe during Easter Day celebrations in Catholic West Belfast. A young boy hurls a disused wooden door at a burning barricade in Belfast during protests in support of Orangemen in Drumcree Portadown. Palestinians in Nablus mourn over the body of a young man killed by the Israeli military during the Second Intifada against the Israeli Occupation. Palestinian schoolkids in Khan Younis, The Gaza Strip, mock Israeli soldiers manning a checkpoint during the Second Intifada against the Israeli Occupation. A young man hurls rocks with his sling shot at Israeli soldiers at a checkpoint outside Ramallah in the West Bank during the Secind Intifada against the Israeli Occupation. 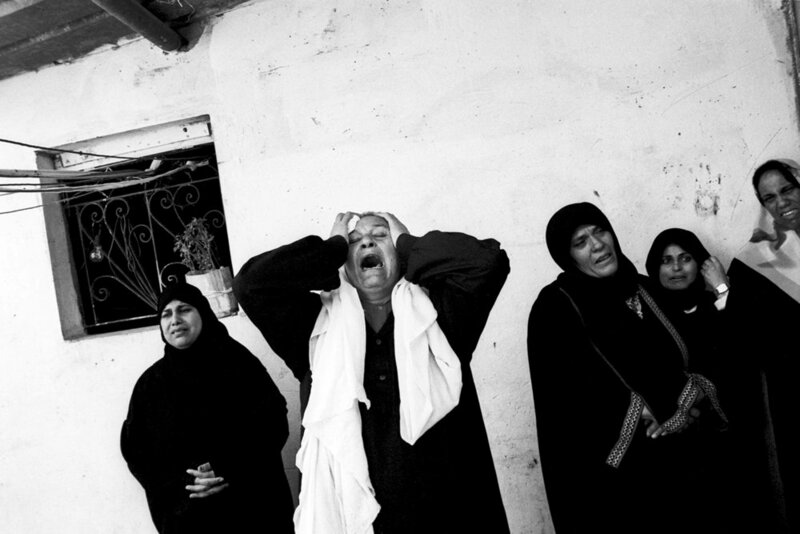 A mother and other relatives mourn the death of her son killed during clashes with the Israeli Army in the Gaza Strip during the Second Intifada against the Israeli Occupation. The poster commemorating a man killed by the Israeli Army seen through a taxi window. Martyr posters are seen all over the occupied territories to remember those who died resisting the Israeli Occupation during the Second Intifada. 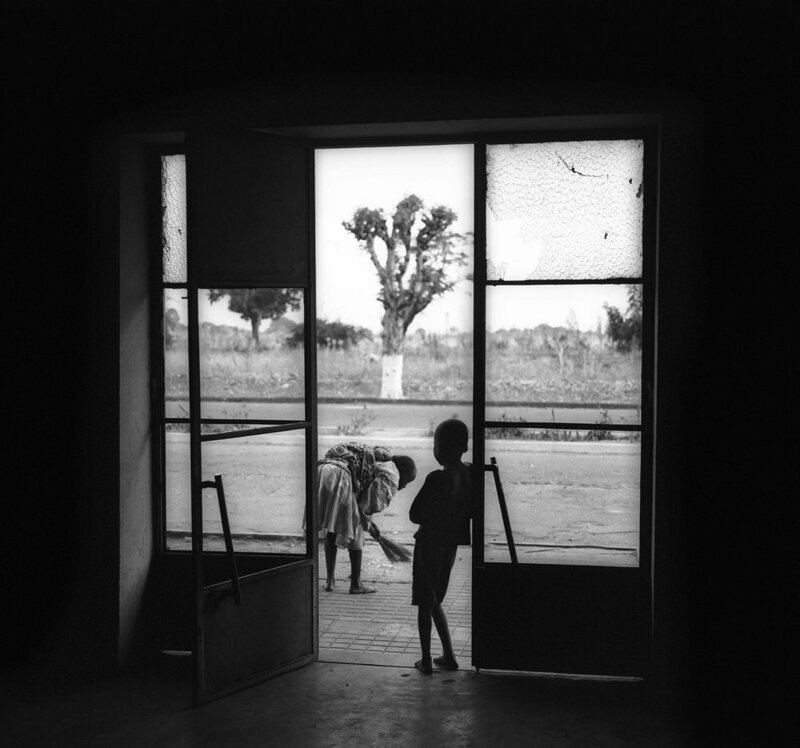 A child watches his mother sweep the front of their home in Camacupa, Angola in Bie Province. Their home along with the rest of the town was heaviily damaged from years of fighting between the Angolan Army and the rebel forces iof UNITA. 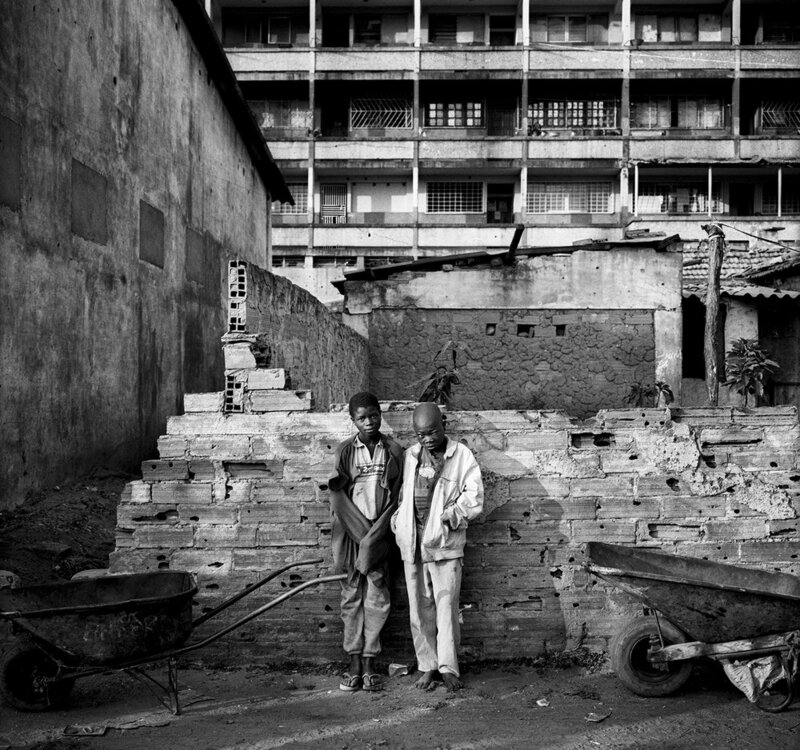 Two homeless boys with their wheelbarrows which they use to earn a living in Kuito, Angola. Kuito was heavily besieged and destroyed but never captured by the UNITA rebels fighting the Angolan government. A woman hacks away at a tree stump in a refugee camp in Moxico Province. 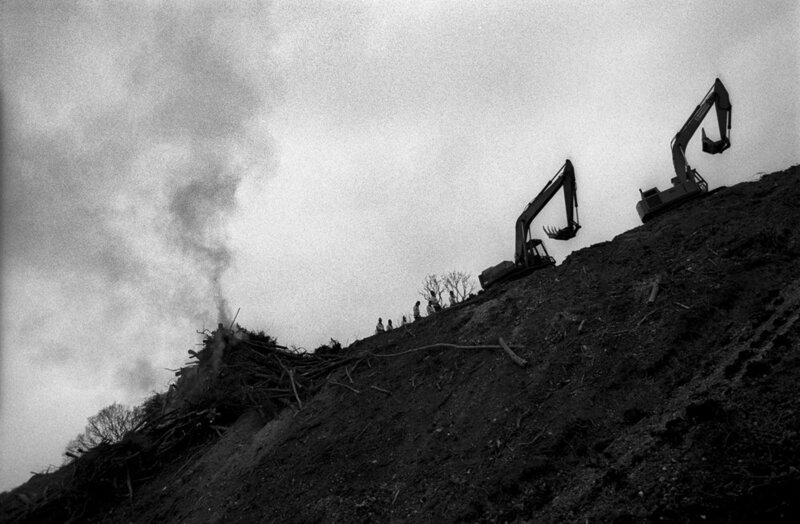 Angola was heavily deforested due the the decades long conflict of independence and then civil war. Refugees wait for aid under a tree in Moxico Province after fleeing fighting between the Angolan Army and the UNITA rebels. 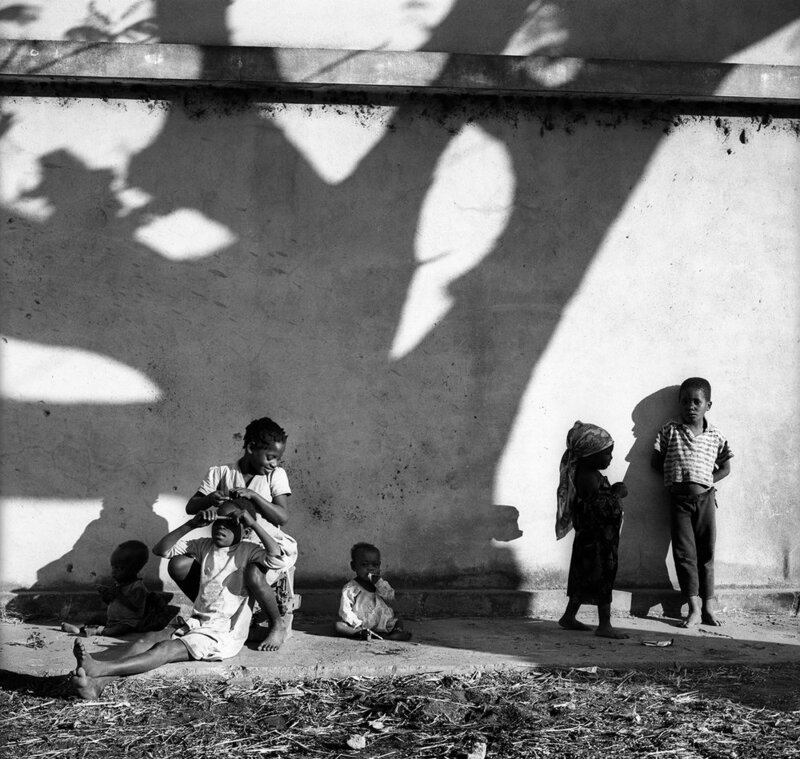 Refugee children relax under the shade of a tree in a Medicins sans Frontier field hospital in Camacupa. Angola in 2001 had the world’s biggest internal refugee crisis due to the 26 year old civil war. A young man takes a nap on top of his motorcycle in Mercado Oriental in Managua, Nicaragua. Two Mayan schoolteachers in their classroom in the highlands of Guatemala near the Mexican border. Young boys play with a bicycle tyre on Cannon mountain, an old fort which overlooks Kabul, the capital of Afghanistan. Brick makers feeding the moori - the glowing openings in the kiln’s surface - with coal. The Kiln is among dozens that dot the landscape of the Shomali Plain outside of Kabul. 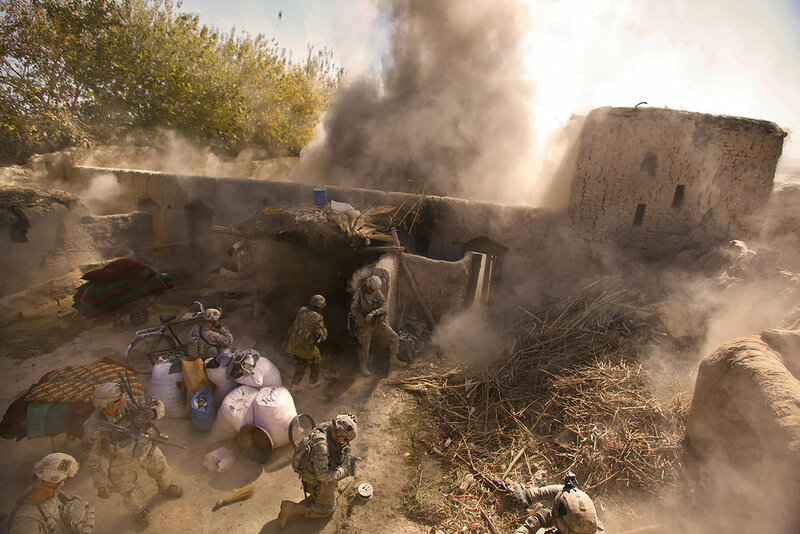 American soldiers blow up a compound suspected of having IEDs. The unit Delta Company 1-187 3rd Brigade of the 101st Airborne is in charge of bringing security to the village of Talukan, clearing it of IEDs and preventing the Taliban from returning. The village is located in the Horn of Panjwai, Kandahar Province, Southern Afghanistan. A Bangladeshi man waits for a bus to Dhaka in the village of Chatia. A boy plays in the ruins of the State House, a former British Governor's residence that has since beome a refugee camp in Hargeisa, Somaliland. A young woman with her baby who live in the eastern slums of the Dhaka, The capital city of Bangladesh. The fertility rate of the average woman is 6 children in her lifetime. Murder #65, Yemurai Kanyangarara, Welling Yemurai Kanyangarara, 16, was stabbed to death in Welling after getting off a bus with a friend. He suffered a single knife wound to the neck and died in hospital. The killing was the culmination of a feud between pupils at Kanyangarara’s school, St Columba's Catholic Boys' School in Bexleyheath, and the nearby Blackheath Bluecoats. Three teenage men were arrested and two were found guilty of murder. Murder #174, Kevin Ssali, Lee.......Kevin Ssali, 14, was stabbed to death in Lee on September 15, 2012. Ssali was attacked on the top deck of a bus. He managed to run out the bus before collapsing in the street. Ssali died in hospital later the same night. Police charged a 17 year-old man with murder. The prosecution case is that an argument started after Ssali mocked the accused’s younger brother. The suspect is to stand trial after publication. Murder #176, Junior Nkwelle, Brixton.....Junior Nkwelle, 15, was stabbed to death in Brixton on September 27, 2012. Nkwelle was found dead at the scene just yards from his home. Police charged Cherelle McKenzie-Jackson, 14, and Marc Anthony Tulloch, 17, with murder. The court heard that McKenzie-Jackson asked Tulloch to stab Nkwelle to punish him for insulting her. Both were cleared of murder but convicted of manslaughter. McKenzie-Jackson was jailed for eight years and Tulloch was jailed for ten years. 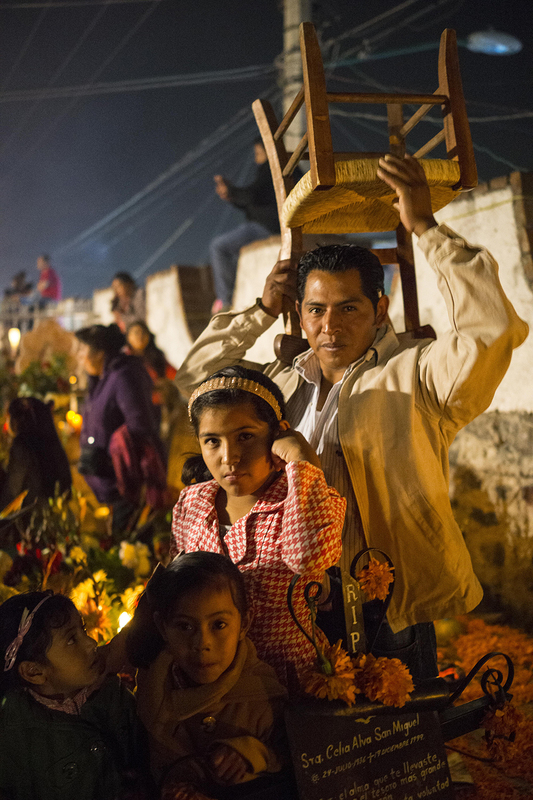 Mexicans visiting their dead relatives, lighting candles, lighting incense and decorating their graves for the Day of the Dead festival in San Andre de Mixquic shot as part of the Sony RX100 III “Celebrate The Streets” series. Pavel Fomenko. Tigers. World Wildlife Fund. A 4 year old Female tiger on the examination table at the Animal Diseases Diagnostics center, Ussurysk. The Tiger had chewed off her paw to free it from a trap of which it had been caught in. The paw, once stuck in the trap was likely to have developed frost bite. Seamus Heany, at his home in Dublin. Heaney was awarded the Nobel Prize in Literature in 1995 for what the Nobel committee described as "works of lyrical beauty and ethical depth, which exalt everyday miracles and the living past"
Ali Smith, writer and novelist, photographed at her home in Cambridge. Her new book is called "How to be Both" . Leonard Cohen, Photographed in Oslo Norway during the world tour of the promotion of the album "The Future".